Perfect the art of yoga sequencing with 90,000+ yoga sequences covering different styles of yoga - Hatha including peak poses, Yin, Restorative, Chair, Prenatal, Power, Therapeutic and more. 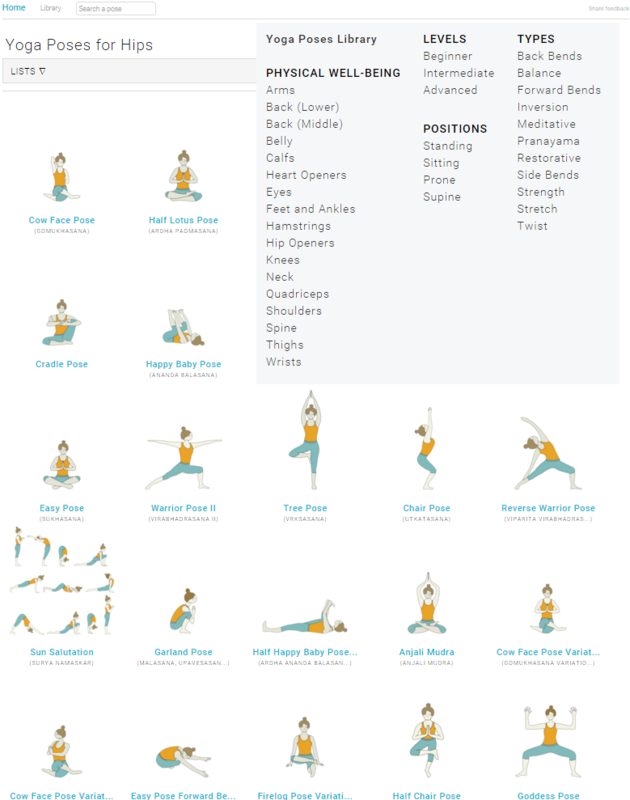 All these yoga sequences are designed by yoga teachers from around the world using our yoga sequence builder. Discover variations of different yoga poses to teach in your yoga classes with blocks, straps, chairs, bolsters, and more. Attract yoga students of all levels and abilities. Signup today to discover new yoga poses and variations. 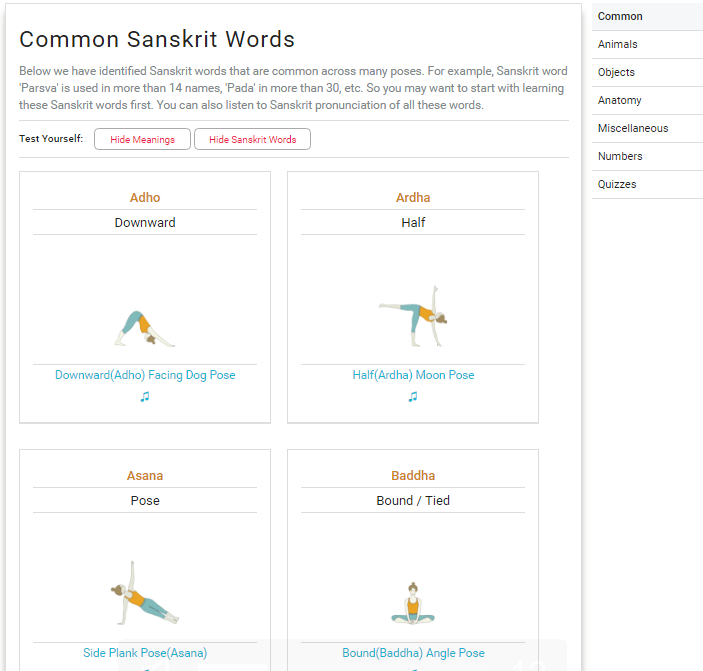 Learn Sanskrit titles of yoga poses and their meanings. Listen to audio pronunciation. Take quizzes to ensure you are learning. Sequence your yoga classes using our intuitive yoga sequencing app. Keep all your yoga sequences organized in one place. Add YouTube videos and Spotify/Pandora playlists to your yoga sequences. Rename yoga pose titles in your own language. 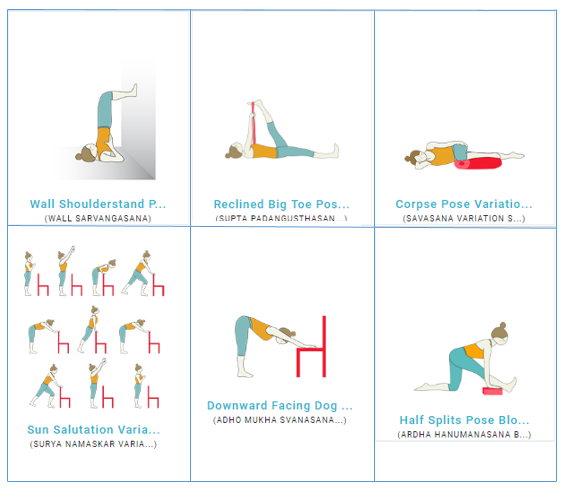 Add breath type, count, duration and more for each yoga pose. Easily share your yoga sequences and cues in your yoga class plans online with your private clients. 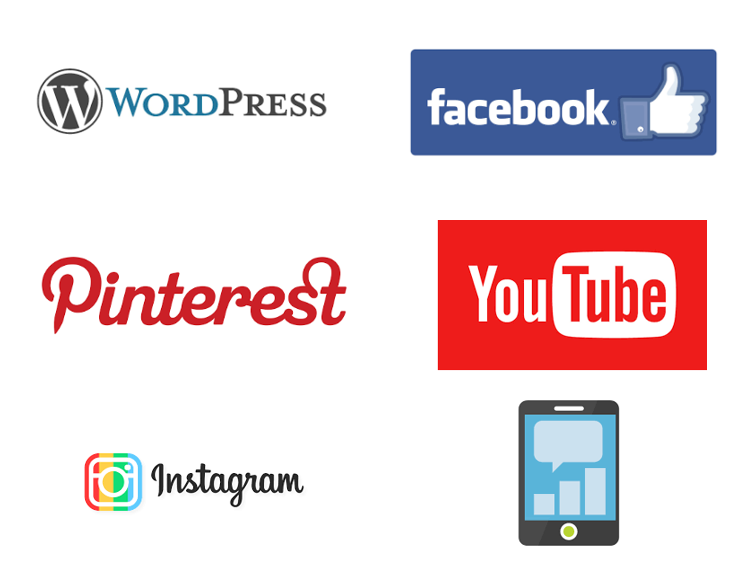 Post your yoga lesson plans on your blog, Facebook page, Instagram, Pinterest, and more. 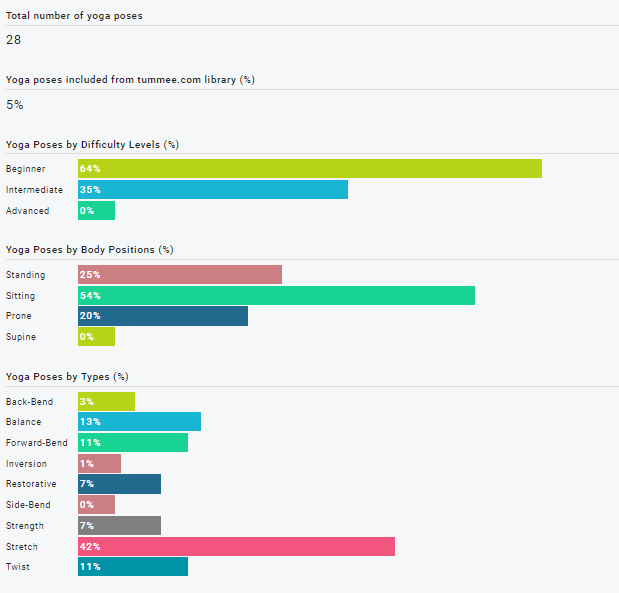 Stats for your yoga sequences help you stay on track and create targeted yoga sequences. 25+ print templates for your yoga lesson plans portfolio and to share with your yoga students. 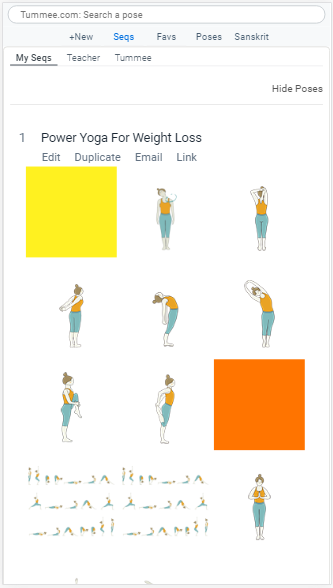 Easily reference lists of yoga poses to plan and design your yoga classes using our intuitive yoga sequence builder and yoga class planning app. You can use Tummee.com yoga sequencing app just as a mobile app on your iPhone, Android phone and iPad. With our easy to use mobile interface you can create, view, and share your yoga sequences on-the-go. Our 2500+ yoga poses, daily reference yoga sequences, and yoga sequencing guides are conveniently available to you in the palm of your hand with our yoga sequencing app! "I ultimately decided tummee.com yoga sequence builder is the platform for me because of two main things: I was able to save and share all my yoga sequences in my own library and the great support and customer service for adding new yoga poses and dealing with any questions. Thank you!" "Thank you! 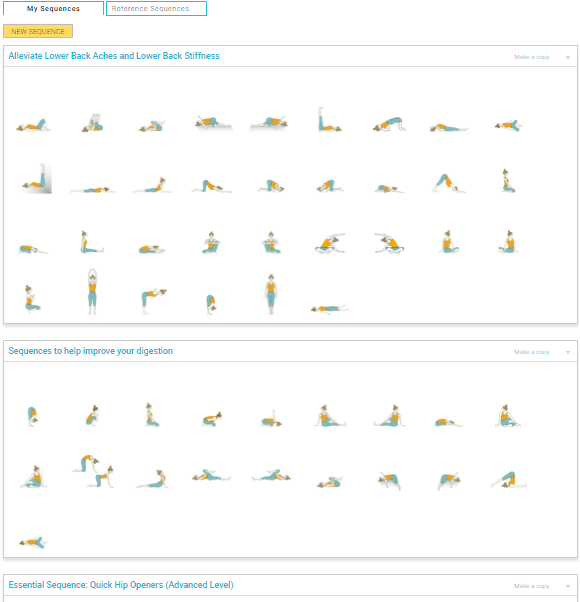 Your yoga sequence builder has been a wonderful tool for me, as it has enabled me to provide additional assistance to private yoga clients with specialized sequences tailored to them and a place to save favorite yoga sequences for my group classes." "I am quite excited about your yoga sequence builder. I recently was certified and I find that it is much easier to sequence and teach using pictures than a script!" "I have been telling everybody about your yoga sequence builder. Two of my instructors seemed very impressed with it. It's so much easier to glance at a yoga pose rather than write them out. 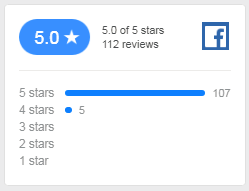 I really like the statistics and the ability to narrow poses down by type and skill level. It also keeps all my yoga classes stored in one place for easy reference and modification. I'm a student but will be graduating in two weeks and I only have four classmates but I will definitely spread the word! Thanks for your hard work! "